What do you imagine first of all if thinking of roulette? The wheel, of course! Roulette wheel is a carefully thought device made by means complicated mathematical calculations. 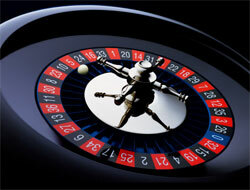 If we look into the roulette history, we can find out that the first wheel was created in 18th century in France. Famous and respectable mathematician Blaise Pascal was making experiments in order to create the perpetual motion machine. In the course of his experiments, he invented the wheel. That wheel was not as the modern roulette wheel we have today. The first roulette wheel was similar to the wheels in Italian and English games of chance. "Hoca" and "E-O" games had their wheels with places for the ball to land. Roulette wheel has taken the features of the both wheels but has more interesting construction. The invented wheel gained a great popularity and soon was brought to the USA from Europe. The game roulette had changed a little in the course of its development and many types of roulette appeared. The most famous are European roulette and American roulette wheel. The main difference between the two wheels is the number of zero slots. European wheel has single zero slot (0) whereas American wheel has two zero slots: single (0) and double (00) zero. Apart from that distinction European wheel has numbers disposed in random order and in American roulette numbers are disposed in pairs opposite to one another but this does not influence the rules of roulette anyhow. It is easy to understand the principles of roulette wheel operating. The wheel is specially designed to be settles at the roulette table. The numbers alternate between 1 and 36, black and red, even and odd and big and small. Moreover, there is a zero slot in European roulette and two zero slots in American roulette. The roulette wheel has also pockets near every number for the ball to land. The construction of the wheel is easier to understand if look at the picture given below.